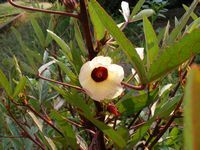 Roselle is a species of Hibiscus native to West Africa. It can grow up to 2m tall and has deeply lobed leaves that are alternately arranged on the stems. The white to pale yellow flowers are 8–10 cm in diameter, with a dark red spot at the base of each petal. It takes about 6 months to turns into a fleshy, bright red fruit. 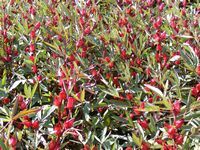 Roselle needs neutral to alkaline soil in full sun. The leaves have a rhubarb-like flavour and can be eaten raw or cooked as a spicy version of spinach. It can be used in curry, steamed with lentils, fried with garlic, dried/fresh prawns and green chilli, made into a light soup or cooked with fish, chicken, crab, pork or any other meat. The fresh/dried calyces can be made into a refreshing drink by boiling it in water for 8 to 10 minutes (or until the water turns red), then adding sugar. Flavour can be added by brewing it with ginger, cinnamon, cloves and bay leaves and adding rum. Alternatively the dried calyces can be soaked in cold water overnight in a refrigerator with sugar and lemon or lime juice. Hibiscus flowers (Roselle) are included in some commercial herbal teas giving it a red colour. In Egypt, a refreshing, sour drink made from hibiscus is called Karkade. 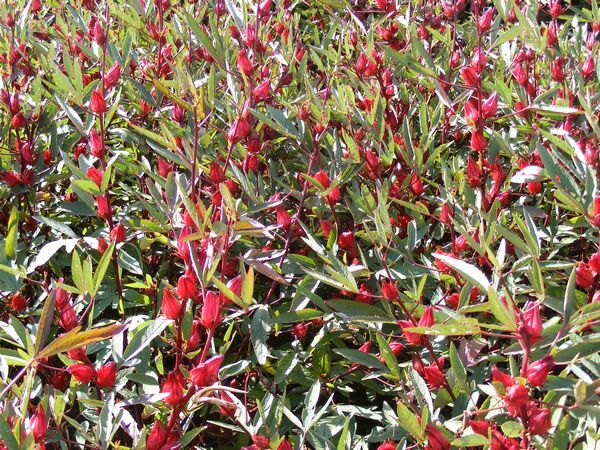 Roselle buds can also be made into sauces, jams, jellies, chutneys and preserves. The seeds are eaten roasted, made into an oil sauce or fermented into Sudanese meat substitute 'furundu'. The leaves, stems, flower calyces and seeds. Hibiscus makes a refreshing, caffeine-free drink that is rich in organic acids. It is used as a general health tonic to treat appetite loss, colds, coughs and circulatory ailments. 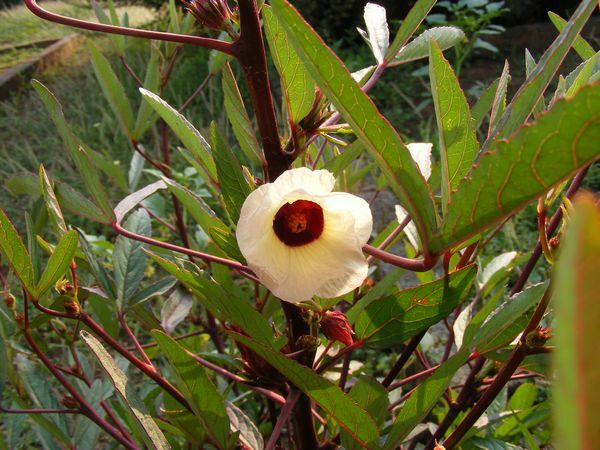 Hibiscus is a gentle laxative, diuretic and expectorant. 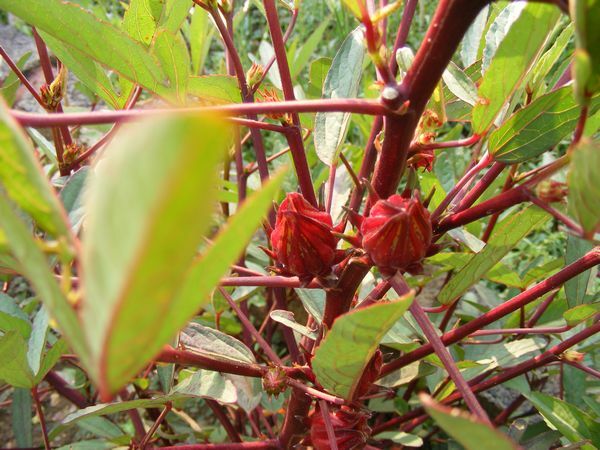 The stems are a source of fibre (rosella hemp) and can be used as a substitute for jute in making burlap.